The first two models in the Cooler Master’s new MasterCase 5 series are out today. These are modular cases, meaning you can get replacement panels, drive trays, and other accessories to customize the case’s functionality. The MasterCase 5 and the MasterCase 5 Pro are the same dimensions at 235x512x548mm, but the Pro weighs a little more, 10.7kg compared to the base product’s 10.6kg. Chalk that up to the Pro’s included top cover and radiator mount for a 240mm liquid cooler. Both have support for three 120 / 140mm fans on the front, two on the top, and one at the rear. They each also have support for water cooling on the front and rear, but the Pro has an extra slot on top. As for drive bays, the MasterCase 5 has room for two 3.5-inch HDDs, and two 5.25-inch optical drive. In addition, these are the first Cooler Master cases to incorporate “slip-and-clip SSD pockets” with four mounting positions, two behind the motherboard tray, and two on top of the power supply partition. The Pro has the same SSD pockets but five drive bays instead of two, as well as five HDD slots instead of two. Two-tray and three-tray bays are available as accessories if you want to fit more drives into the base model MasterCase. All the drive bays, including the optical bays, are removable, and lock into place with what Cooler Master calls its “click-and-clip” panel. That allows you to vertically adjust the ODD and HDD drives via sliding locks. You can also put in replacement accessories such as fan brackets and GPU support brackets. 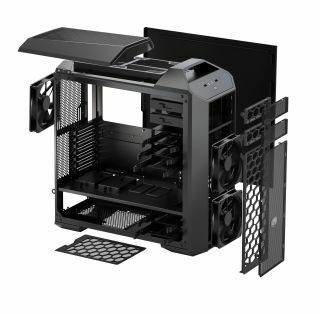 The MasterCase 5 Pro comes with a mesh top cover, a top water cooling bracket, and a side window panel, which can also be purchased separately for the base model. The normal case has two handles at the top, but the top cover replaces one of them. The MasterCase 5 was one of PC Gamer’s 12 cases from Computex 2015 to watch out for. They’re available now from the Cooler Master store, and Amazon for $109 for the base model, and $140 for the Pro, though they' both currently out of stock on Amazon.